Artist Bruce Pennington has an exhibition at Atlantis Bookshop, Museum Street, London WC1A 1LY from 29 July to 27 August. See http://www.brucepennington.co.uk/ for more details. As well as The Technicolor Time Machine cover painting for N.E.L. 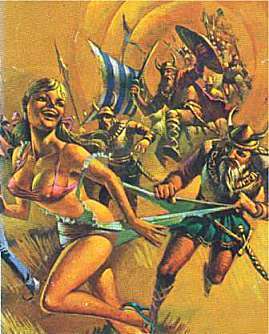 (above), Bruce Pennington also did several other covers for Harry Harrison books, including a couple for the Stainless Steel Rat series. I probably first encountered the artist’s work on the covers for the NEL editions of the Dune trilogy, and the cover of several Gene Wolfe titles — incredible, other-worldly paintings. If you can’t make it along to the exhibition, try and get hold of a copy of Ultraterranium: The Paintings of Bruce Pennington — it’s one of my favourite collections of artwork.